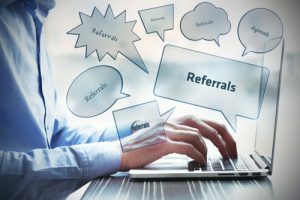 Encouraging referrals is one of the most effective ways to create a steady stream of construction leads and this approach isn’t limited to in-person exchanges. Strategic referral marketing online can bring you more leads with less effort. When a satisfied client directs a lead to your website, that lead may still be collecting information and exploring their options. By the time they’re ready to do business, chances are high they’ll forget to mention who sent them and the referrer loses out, discouraging further referrals. To prevent that situation, use software that lets you give anyone who might send you business a personal referral link to your website. This lets you track signups and downloads by referrer. Another option is to provide a personal code they can pass along that will let the lead access valuable downloads on your site. Tuning in to what’s being said about your firm on social media makes it easy to spot fans who would be happy to send leads your way. With a tool such as Google Alerts, Social Mention or Hootsuite, you can quickly track down any social media mentions of your firm’s name or projects you’ve worked on. When you find someone talking positively about your work, reach out to let them know you appreciate referrals and invite them to take part in your incentive program. Part of successful referral marketing online is making sure your firm is the first one your former clients think of when someone they know needs construction work done. Maintaining that level of awareness takes regular contact beyond follow-up phone calls and post cards. Online content lets you keep in touch consistently yet unobtrusively. Use your blog and newsletter to publish genuinely useful information that keeps your clients coming back. Periodically offer handy tips sheets, templates, and other resources. When you can, create detailed white papers you can pass along to former clients, and they can forward to their network.